Since I plan to ski at Massanutten several times in January, thought I’d put all my notes in one place this season. The big news for snowsports is that the water pipeline is almost finished. Will add substantially to the amount of water available for snowmaking. Last winter when there were cold snaps, lack of water was a significant reason why snowmaking was not optimal. Mnut has a lot of automated snowguns that can put out a great deal of new snow in a short period of time when it’s cold and dry enough. Looking forward to watching the webcams! Construction of a new, 2-mile-long water pipeline began in January 2017 and is scheduled to be completed and ready for the upcoming winter season. With the help of Mother Nature, the new pipeline is paying off for sure. The amount of snowmaking that’s happened since late last week is very impressive. Guns have been on for Geronimo from the start. I’m not sure, but I think there are more big snow guns on the tubing area than before. It’s in the teens this morning. Snow guns were on again by 5pm yesterday. It’s going to be really amazing for opening day on Friday, 12/15/17. There is a link to a Wunderground page for Massanutten on the Mnut website. Makes it easy to see past weather data. Haved worked out my travel schedule to fit in a little time on the Mnut slopes on Opening Day. Will be skiing first thing in the morning 12/15. White helmet with red ribbon on the back if anyone else is interested. Early season rates. Regular season rates start 12/16 as previously scheduled. Looks like Upper Showtime may be open, along with Geronimo. The core trails will have a much deeper base than recent years: Southern Comfort (green), Lower Showtime (blue), Diamond Jim (black). Temps at Massanutten are in the 20s today after dipping below 30 around 4:00am. Slopes won’t opening for holiday sliding until noon as is the norm for Christmas Day, but the snowmakers and groomers are working hard this morning. Best news is that they will be starting on Mass Transit, Yee Ha, and Paradice. Having those trails open by the demo weekend Jan. 6-7 will be great. Happy Holidays! Today’s high temperatures will top out in the mid 30s with a chance of some light snow later tonight. We’ll be skiing and riding on 6 trails today. Freestyle features are on lower Nutten-to-it. The Ski Slopes and snow tubing are open from 9:00 am - 5:00 pm today and 12:00 pm - 8:00 pm tomorrow. Regular season rates are in effect. No night sking tonight. Snowmaking temperatures return late tonight. We’ll be be freshening things up on our open terrain before moving on to Mass Transit, Yee Ha, Paradice and Pacesetter. Looking really good for the Demo Weekend at Massanutten on Jan. 6-7. All the trails are already open, most importantly Mass Transit and Yee Ha so that going between Lifts 5 and 6 will be possible. MakAttack is open too as of today. Only run not open yet is the CMB Terrain Park but here are park features on Pacesetter. Temperatures moderating to a more comfortable 30 degrees today. Come test out the awesome snow conditions - The mountain ops team has gotten us to nearly 100% open today with Upper and Lower Mak Attack along with the Pacesetter Terrain Park opening today. Snowmaking will shut down mid-morning, 40% chance of light snow this evening. Very cool. Will try to get out there sometime next week. Have you gone yet? Temps on the upper mountain will stay under 30 for a while longer. They are continuing to blow snow at night but not during the day on open slopes. At least not the trails with plenty of base already. I’m heading to Massanutten on Friday afternoon for the Demo Weekend. Skied there this morning. Conditions were great! Bumps on Upper Mak, but there was so much ungroomed, unpacked man-made that it didn’t really ski like a bump run at all. Big snowmaking whales on the upper part of paradice - I wonder if that is a feature they will keep? Snowmaking going on all over the mountain, even on the open trails - I was glad to see they are being aggressive while they can. Overall I would say these are some of the best conditions I have ever seen at Mnut. One note: Lift 4 was not running, and it was still being serviced when I left around noon. Not a big deal today, since all other lifts and connector trails were open, but something that will hopefully be fixed before the weekend. The snow whales on Paradice stay as long as the snow isn’t needed to increase the base. Definitely makes it a more interesting run. Very cold temps with excellent snow today at Massanutten. Best conditions for a demo day in years, perhaps ever. Been a while since it was possible to check out skis on bumps on MakAttack. It was 3 degrees when I pulled into the parking lot at 8am. It was 13 degrees when I left around 3:30pm. The slopes were pretty empty for a Saturday. The demo tent was relatively busy though. Having BOGO vouchers might have brought in a few people. But it’s probably more that the advanced trails were all open. That meant being able to go between Lifts 5 and 6 easily. Giant snow whales on Mass Transit required some care. Could easily end up with unexpected air going off the top of a whale too fast that was 8-10 feet high. Quite solid and on a slick side. When it warms up, the base on that trail will be plenty deep to last for a while. I skied at Massanutten yesterday, too. 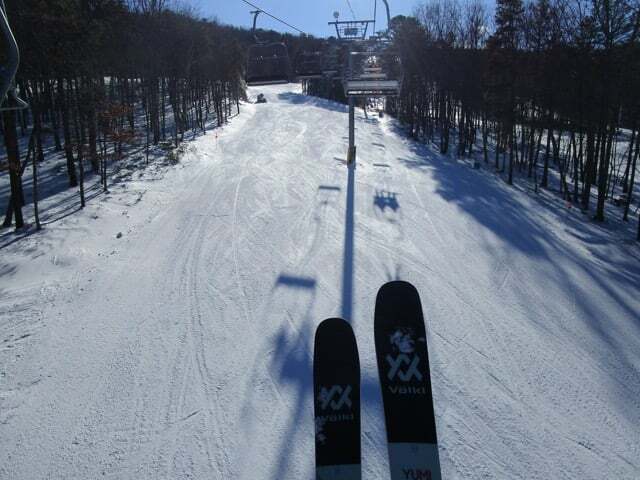 it was only my second time skiing Massanutten and what a great day it was (even though it was pretty cold). I really had no idea that man made snow could be so fantastic. The crowds were really small and a big shout out goes to Freestyle Ski Shop for the ski demo. They had skis from Head, Blizzard and Volkl, so Supershapes, Quattro’s, RTMs, as well as the Brahma and the Kendo were on the “menu”. They also had Apex ski boots available for demo. If I’d had more time, I would have loved to try the Apex boots. As someone who has dealt with a lot of boot pain, those boots and their radically different approach are very interesting to me. Because the demo tent was set up at the base of lift 6, I only skied the two trails off that lift - ParaDice and Diamond Jim. Again, I really couldn’t believe how good the snow was/is. I generally only ski anywhere after they have had a recent snowstorm because I expect hard, icy conditions otherwise, but the conditions at Massanutten really opened my eyes. Finally, the JMU championship football game was being played yesterday on all of the tvs in the bar, so a very interested/vocal crowd was cheering them on. It was a fun atmosphere to cap off a great day. I was very impressed with the quality of the man-made when I was at Mnut midweek. It will be interesting to see how it holds up to a couple freeze-thaw cycles. Glad you had a good time. I took a couple demo skis over to Lift 5 to use them on the big bumps on MakAttack. With Mass Transit and Yee Ha open, it’s relatively easy to go between the two lifts on the upper mountain. Showtime was in great shape. It can have the best conditions when DJ is a little skied off. I tried out the Apex boots this afternoon. A friend tried them yesterday afternoon. I know he was impressed. Will write up something later. Just drove home (4 hours) and want to find my bed sooner rather than later. 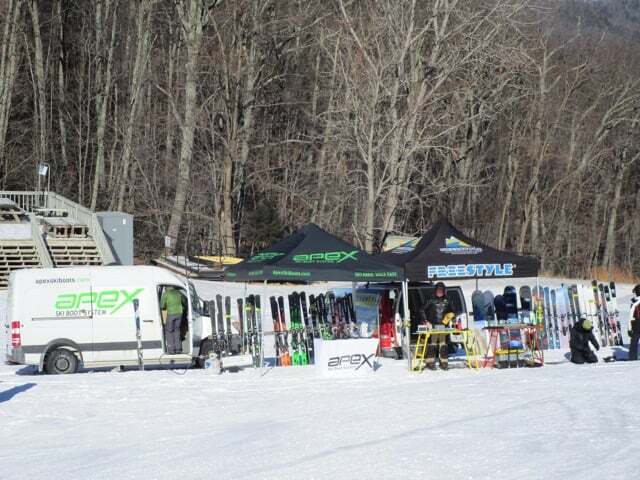 Demo weekend by Freestyle Jan. 6-7 included men’s and women’s skis by Head, Blizzard, and Volkl. Plus some snowboards. There was also the opportunity to test out the latest models of Apex Boots. Sunday it was essentially single digits all day. The slopes were empty but there was a steady stream of people taking out skis from the demo tent. Even busier on Sunday when it got into the teens by lunch time. Upper MakAttack had big bumps so worth going over with demo skis for a run. Lower MakAttack under Lift 5 fully covered. Had a good time with the Volkl Yumi and I don’t usually like Volkl skis. Looking good for Mnut for the MLK weekend. Highs in the low 30s, with snowmaking temps at night. The base was well over 30 inches on all the trails before the warm up. Have to say that after a frigid weekend, not having to wear extra layers will be nice. I’m a big fan of Volkls; I demoed a bunch of different brands/skis a few years ago, and now I’ve got a pair of Gotamas that I love. My wife did the same thing last year and she ended up with Volkls - Kendas I think. Then my daughter picked up a pair of Volkls at a ski swap and loves them - mostly, I think, because they have twin tips and so shoot a pretty big rooster tail of snow behind her when she skis lol. The Volkl RTM81 and RTM84 were pretty popular. One of the Mnut patrollers loves his and was convincing all his friends to try them out. Snowmaking all day today on the CMB Terrain Park that hadn’t been blowed at all yet. Guns went on in the afternoon on Upper and Lower Showtime and MakAttack. Made it a lot nicer by the night session. The big bumps were actually pretty fun. Guns were pointed high. Paradice was very slick in the late afternoon. Completely skied off down to the frozen base that melted Tue-Fri. It was 60 degrees on Friday evening and 30 degrees by 9am Sat. Will be on the cold side on Sunday. High probably only mid-20s. It got busy on Saturday around 12:30 but had thinned out completely by 4:00 when we went back. We’ll see how long the slopes stay empty on Sunday morning. As expected, not a very big crowd on Sunday. Quite empty on Monday since it was still in the 20s, but a bit warmer than Sunday. After snowmaking all night Sat, and continued snowmaking on the upper mountain on Sun, conditions on Sun were pretty good. Conditions on MLK Day were fabulous for those few travelers who decided to ski before heading home. MLK Day is not holiday rate. The bumps on MakAttack were mostly machine powder but there were a couple of slick bumps. Still edgeable though. Snowmaking continuously for the CBT Terrain Park since it wasn’t open yet. Also made new piles for the features on Pacesetter. Shell jacket worked well today at Massanutten. Temps were mostly in the 30s all day. The snowpack is deep enough that it felt colder and there really wasn’t any noticeable melting. Should be very good conditions on Sat morning. 100% open now that the CMB Terrain park (the one with a J-bar) is open. Nuttin-to-It is back to being a green connector between Lift 3 (Geronimo) and Southern Comfort. The bumps on MakAttack are fun. The bumps at the top of Paradice are a bit strange because they are being more by folks who want to catch air. For the first time there are easy bumps seeded on Geronimo (green) where the beginner terrain park used to be. There is a zipper line that can be practiced. I treated my Head Absolute Joys with DPS Phantom yesterday. As expected the first couple runs were a bit weird. It was like skiing on spring conditions sticky snow. But after that, they were quite nice on the packed powder. Supposed to be warmer tomorrow so may get a sense of how the Phantom does in soft snow. Had a good time at Mnut Jan. 19-21. Best day was definitely Friday but spring conditions on Sat and Sun felt good after two frigid weekends in the first half of January. Got a little too warm for the lower mountain in the afternoons. Good conditions for the Gold Clinic on Sunday morning on Upper Showtime. Pretty fun doing a group lesson with about 8 advanced skiers with Walter Jaeger. I think this is the third season for the Gold Clinic. Some people have done it every time, but there are a few new students this season. Even only attending the first four sessions is well worth it to me for $245 (total 8 Sunday mornings). Snowmaking is so fickle. Need cold temperatures, appropriate humidity, enough water to last through a longer cold spell when nothing melts, and electricity. And of course a knowledgeable and dedicated team of snowmakers. Last night the snowguns were on by 10pm when I checked the webcams. But apparently there was a power outage at some point overnight. Should be pretty good for the weekend. Last night it was the temps that didn’t cooperate for all night snowmaking. Still should be good on Saturday. Hoping to get in a few runs in the afternoon/evening. Sunny with high temperatures near 50 today. The temperatures crept up overnight forcing us to shutdown snowmaking around 4:00am. We are 100% open for skiing and riding on what should be a beauttiful day! Snow tubing is open until midnight today and tomorrow. Although the skiing will probably be okay, I’m going to head farther north this week instead of risking skiing in the rain at Massanutten. Have more reasons to try to get to Boston before it snows. 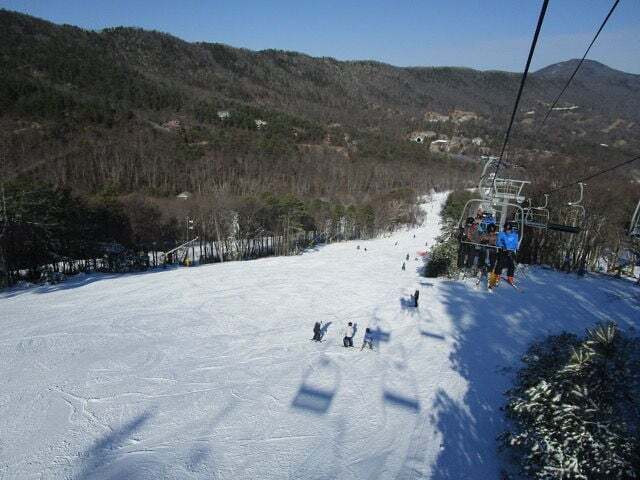 Skied at Massanutten last weekend, Feb. 3-4. Apparently guns were on most of Sat morning. Wasn’t bad on Sat evening, great in fresh snow on Sun morning until 11:00, but then the rain started. Was pouring by 11:30. Was finishing up the Gold Clinic (5th of 8 weeks) so got pretty soaked. But it was worth it because of the topic we covered. Good thing that there were deep snow whales that could be spread out. Still quite deep everywhere. Apparently the big bumps on MakAttack got to be too much solid ice so they were flattened. Makes for a good place to practice making turns on “ungroomed” terrain without looking for a line but just skiing as if it was groomed completely. A little snow coming mid-week but turning to “mixed precipitation” unfortunately. Freestyle of Charlottesville is doing a Demo Day as part of the Massanutten Snow Moon Festival this weekend to kick off the Winter Olympics. The tent will be there 9:00-2:00 on Sat, 2/10. Looks like there is a drawing for an Oakley helmet and goggles. Skied Mnut this afternoon. Fun bumps at the top of paradise. Coverage ok on most runs, but the top of MakAttack (before the headwall) had major dirt showing thru - would not surprise me if it was closed tomorrow. I also think Mass Transit may be lost at some point this week. Massanutten is done for the 2017-18 season. My friends who were local season pass holders and doing a multi-week lesson program were told by a long time patroller this morning. Not even enough snow left to keep slopes open for Sunday, Feb. 25. Will have one more day of snow tubing. Rollercoaster season for sure. The additional water supply was the main reason that it was possible to make it thru Pres. Day weekend. Ah, well. Was hoping for some midweek turns there but this is not surprising. Here’s hoping things turn around in WV at least. Lights are on and snowguns are blazing on Southern Comfort as of midnight 03Mar! The lower mountain was almost completely bare during the day. 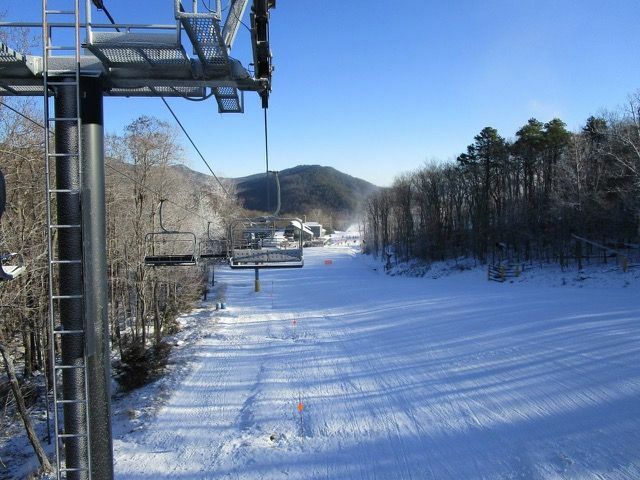 Massanutten is working hard to have a few slopes open for the weekend. Boy Scout day is Sunday. Hope they make it. Good for them! Glad to see many of our local resort fighting to extend the season. Ya props to them for making snow for the scouts. I’d have thought most troops would have cancelled or made other arrangements by now. Good deal that MN is able to get some terrain open tomorrow. Southern Comfort and the teaching area are covered from what I can see on the webcam. They didn’t bother to blow snow for tubing at all. Hoping an update will be posted this afternoon. Temp at 1pm is 40 degress on mountain so shouldn’t lose much to the sun. By 3pm the sun is pretty much behind the mountain and it cools off quickly after that. They did it! Massanutten re-opened. No blue terrain but Lift 6 is open for Diamond Jim and Paradice. Can see folks on Southern Comfort (green) and the teaching area via the webcam. March 11 is Heroes on the Hill Day where military families can get free lift tickets. I’m guessing that with cold nights predicted for the coming week, the idea is to be open next weekend as well. I don’t see Scout Day any more so perhaps that was cancelled. I hadn’t looked for a while. Season pass holders are encouraged to bring a friend once while the slopes are open. Can get one free lift ticket. That’s a new idea I think. Well after a week hiatus we are back in the game. We’ll be open today from 9 am - 5 pm with Southern Comfort, Diamond Jim and Paradice open served by lifts #4 and #6. NO INTERMEDIATE TERRIAN WILL BE OPEN TODAY. THIN AND NARROW SPOTS EXIST, SKI WITH CAUTION! Ski Season Passholder bonus - Ski Season Pass Holders Buddy Special! Starting March 4th, ski season pass holders can receive one free slope-use ticket for a friend. This special can only be used one time per Passholder during the 2017/18 snow sports season. Season pass holders must show their season pass at the ticket window to receive their one free ticket. Heard from a couple friends who skied off Lift 6 this morning. Paradice still open, although narrow in places. DJ was narrow but about the same as when one side is closed for racing. Even though it was still cold enough first thing in the morning, snowguns were off by the time the lifts opened. Snow stayed good until 1:30 or so when it was getting soft. Apparently winds gusted to 60+ mph. The Base Camp umbrella bar held up. Figured out what happened for Scout Day at Massanutten. It was rescheduled from March 4 to Sat, March 10. My guess is that most of the scouts and scout families who take advantage of Mnut’s Scout Day do it as a day trip, not a weekend event like some troops have done at Timberline or Winterplace. March 11 was always on the calender as Heroes On The Hill day for military families. By next weekend, Lower Showtime will be open in additon to Southern Comfort, Paradice, and DJ. That’s pretty much the base for late season slopes by mid-March. Having anything else open is a bonus. Massanutten might actually see a few natural snowflakes as the clouds move towards the northeast. In any case, the plan is to open Lower Showtime and even Upper Showtime by the weekend. Will be cold enough for snowmaking everynight for the next week or so. For intermediates and advanced skiers, this weekend is going to be great considering it’s the second weekend of March. Paradice, DJ, and Upper/Lower Showtime will be open. Beginners will have Southern Comfort and more adventurous beginners can give Lower Showtime a try from Lift 5 mid-station. Another full night of snowmaking Friday night, and Saturday night, with the possibility of natural snow on Sunday! Going to be open next weekend too, March 16-18. “Awesome day today, sunny with high temperatures in the mid 30’s. Upper Showtime will re-open today. We’ll be open daily through Monday, March 12, close March 13-15 and reopen Friday, March 16 - Sunday, March 18. As always, check our snow conditions page for the most up to date information regarding snow conditions and operating hours. We optimistic about a possible snow storm on Sun? Been snowing at Massnutten for a while. Ski patrol reported 4 inches at the summit by lunch time. Easy to see the new snow in the webcam. But still going to be closed Tue-Thu before re-opening on Fri for the final weekend. Is it possible to find out if they are going to blow snow this week before re-opening Friday? Depends on the temps. Looking at the forecast, there will be very little melting between now and Thursday. With 4+ inches added on the upper mountain, won’t be much reason to add there. Might blow some on Friday night to help keep things nice for the weekend on the lower mountain. But that’s just a guess. Well, the chances that Massanutten is going to make more snow is a lot higher as of today. Turns out that March 18 is not expected to be Closing Day. They are shooting for another weekend, Fri-Sun, March 23-25. I can’t remember when/if Mnut was open past mid-March. We’ll be closed today and will reopen Friday, March 16 - Sunday, March 18. The current plan is to close March 19 - March 22 and reopen for March 23-25. Friday’s forecast is just about perfect with plenty of sunshine and high temperatures right around 40. We’ll have 5 trails and 4 lifts open for the weekend. Getting a little thin at the base around Massanutten after a few days of temps in the 40s. Certainly seems as if snowmaking will happen before Friday, 3/23. Lots of sunshine with high temperatures in the lower to mid 50’s. Grab your sunscreen and enjoy the snow. We will be open today from 9:00 am - 5:00 pm. We plan to close March 19 - 22 and reopen for March 23 - 25. A potential midweek snow storm might change that plan! As always, check our snow conditions page for the most up to date information regarding snow conditions and operating hours. Snow Tubing is closed for the season. Bonus days happening this week at Massanutten. Going to be open Wed-Sun, instead of Fri-Sun as announced earlier. An email was sent to Massanutten owners this afternoon that “Snow is currently falling and the NWS is predicting 3”-7” or 4”-8” for tonight and tomorrow with other forecasters calling for the same or more.” 8-hr lift tickets for families (and teachers) who have a snow day tomorrow will be $25, with $15 for gear rental. Winter Storm Toby has brought with it some spring powder days - and we just couldn’t wait until Friday to open! Our Ski Slopes will be open tomorrow, Wednesday, March 21 - Sunday, March 25 from 9 am - 5 pm. Winter Storm Warning in effect through Wednesday with 4” - 8” forecasted. We plan to have 5 trails and 4 lifts operating. As always, check our snow conditions page for the most up to date information regarding snow conditions and operating hours. Snow Tubing is closed for the season. Powder day at Massanutten! Ski patrol found 8 inches at the top this morning and there was 5 inches already at the base. Was it confirmed that it was powder and not the wet stuff? I’m thinking of heading there tomorrow, but have a later start than I’d like (9:30ish from Alexandria in all likelihood). I was watching the temperature and the webcams today. Never got over 30 degrees on the mountain. You can see the records on the WUnderground website tied to the Mnut weather station. Whether or not they decide to groom DJ and Paradice tonight is harder to say. Although likely to leave the left side (skier’s left) of Paradice alone if there are any bumps there. Only checking the webcam. Too much else going on this week with my daughter home for spring break for me to consider a 4-hour drive from NC. Flying to Alta on Monday. Yeseterday was fun and today is looking pretty sweet as well! The storm totaled out at 6”- 9” and was just what the Dr ordered. Partly sunny with high temps around 40. We groomed right at close yesterday afternoon so there should be some soft corduroy out there with a skiff of new snow on top. As always, check our snow conditions page for the most up to date information regarding snow conditions and operating hours. We plan to ski/ride daily from 9:00 am - 5:00 pm through Sunday, March 25th. Snow Tubing is closed for the season. If I could leave NOW, I’d defintely be headed that way. However, I can’t leave until 9:30 or so, so I might hit Whitetail. Decisions, decisions. Would love to get out there for a couple hours but after taking yesterday off to hit SS I just can’t swing it. Let us know how it is! My heart says Massanutten, the clock says Whitetail. Leaving this late, I can’t spare the extra 90 minutes roundtrip. Even more bonus days for Massanutten. Not only this weekend but also Monday, 3/26. Even have hopes of being open Fri-Sun, 3/30 thru 4/1. But the good conditions for spring skiing in temps in the 40s are the next few days. Cold enough for snowmaking overnight Sat-Mon. so that may happen in order to beef up the base depths. Rain and temps in the 60s predicted for Wed-Thu. David McCue wrote up a blog article about his good times at Massanutten. I think he was there on Friday, 3/23. Apparently can get a $25 lift ticket with any other season pass. DJ and Paradice look to be in good shape. He heard that snowmaking is planned when it’s cold enough the next few nights. Ah, well, looks like Monday is a no-go for me. Hopefully a decent number of people will be able to take advantage of the extended season. Still hoping for a final day at SS this coming saturday. Nice! Love that they are hanging on. Wish I lived closer. I could probably be down for a couple hours of skiing next Saturday or Sunday but not motivated enough to waste 6 hours of driving to make that happen. Probably done for the season but would definitely consider another short session if it were more easily obtainable.